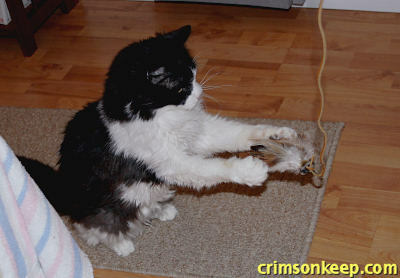 I’ve read about this cat toy called “Da Bird.” Everyone seems to swear by it and love it, so I looked it up. Turns out it’s essentially feathers attached to a string attached to a pole of some kind. Now, I don’t know the exact mechanics of this popular cat toy, but my thought was: “I’ve been using leather shoelaces/crinkly plastic and part of a fishing pole for years, this isn’t new.” My cat Misty loved that fishing pole/leather shoelace thing - she’d chase it for hours, drag it around the house, and would even bring it to me as I sat on the couch watching TV. The most obvious difference of Da Bird is the feather tip. And I suspect Da Bird uses a more stretchy, springy type string than leather bootlaces. Still, since I’m cheap and like to tinker with things, I thought I’d try making my own Da Bird. Kind of. I mean, y’know, it won’t have the springy string to make it bounce around, but that’s what arm muscles are for. And a leather shoelace lasts for years. I know, because the toy Misty played with I only ever used one shoelace for it, and it lasted for a decade. Alas, I don’t have that fishing pole piece anymore, so I’d have to improvise for the stick. The local Walgreens had a cat toy that consisted of feathers attached to velcro-backed cloth, which then was stuck to cloth covered balls. These came three to a package, for four bucks. Then the leather shoelaces - about the same price for a pair, maybe it was closer to six bucks, I don’t recall. Eight to ten bucks for 3 imitation Da Birds. 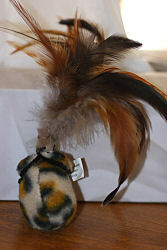 Maybe even 4 or 5, if I split the feathers - there are more feathers on these ball-toys than on the Da Bird’s I’ve seen. Now, I’ve seen Da Bird advertised on-line for about $6-$8 each (Edit:they’re a bit cheaper now, in 2010), not including feather refills. So it’s not tons cheaper to make your own, but for me at least, it’s a lot more fun than just buying. You could probably do it cheaper than I did, too. I wasn’t trying to be ultra-creative. Anyway, I took the feathered ends of one of these cat ball toys and unvelcro-ed the feathers from the actual ball, so I was left with just the feathers+cloth they were attached to. Next, I went into the backyard. One of the big trees that covers our yard drops thin branches all the time. I scrounged around until I found one that would work as a stick handle. 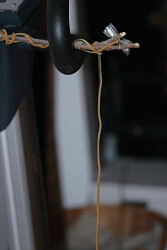 I tied a shoelace around one end of this stick. 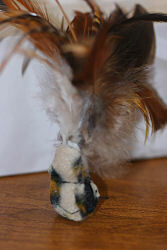 Then I took the “feather bundle” and with a small pocket knife made a slit in the attached fabric. I threaded the shoelace through that, tied it off, and wallah. I have feathers on a string on a stick. Probably more durable than Da Bird, too, based on pictures I’ve seen. 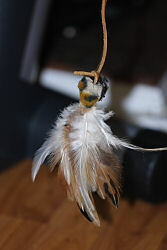 So, I had my homemade feather toy. All I needed was a cat to try it out on. I called out for Baby, who eventually got out of his sleeping basket to come see what I was fussing about. He meowed in greeting and sat at my feet. I tossed the feathers in front of him and jiggled the toy around. I skated it around the floor, made it jump and leap in the air, and I walked around the couch dragging it behind me. 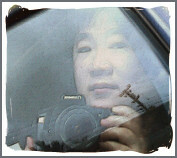 During all my efforts, Baby stared at it curiously. I believe he yawned a few more times. 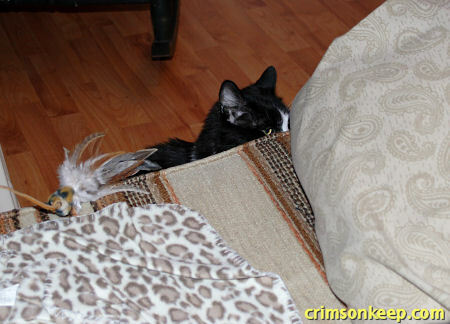 He occasionally stuck out a paw to poke at the feathers. He meowed some more. After a bit, he followed me around the couch, but mostly because that’s what he always does - follow-the-leader - he didn’t seem very interested in the toy itself. After a while he even seemed a bit annoyed that I had woken him up for such silly non-food-related shenanigans. I kept at it for a few minutes longer, and Baby finally did have a few burst of playful energy, as illustrated by the next photo. But I wouldn’t exactly say the toy was a successful hit or anything. Heheh. Posted on Thursday, May 29th, 2008 at 10:29 pm	under the category -Random Articles, Cat & Pet Tales.